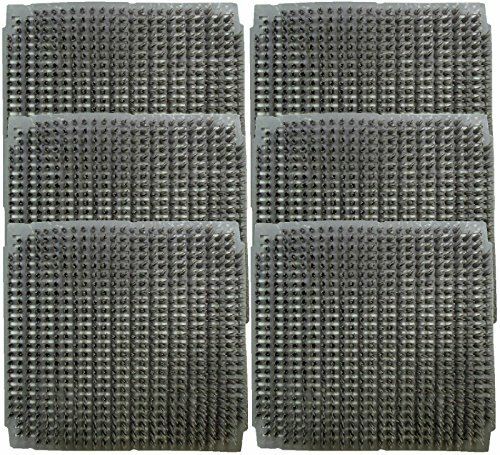 6 pack of grey plastic nesting pads. The plastic nest pads are designed with a slotted base as pictured, not only to allow air circulation but also to allow droppings to go through the nest pad. This greatly reduces the bacteria growth due to wet nest material. You will save a lot of time, labor, and money with plastic nest pads. There will be no more need for filling nests with shavings and other nest materials. Washing and disinfecting pads is made easy because they are all plastic and water can go through the pad giving you a far more sanitary operation when cleaning. Measures 11 7/8 inches x 11 7/8 inches. Can easily be scissor or shear cut to fit most nesting boxes. Will fit all nesting boxes we sell at CoopsNMore. If you have any questions about this product by Rite Farm Products, contact us by completing and submitting the form below. If you are looking for a specif part number, please include it with your message.